International Journal of Research in Health Sciences,2013,1,2,96-102. 1Assistant Professor, Department of Community Medicine, Apollo Institute of Medical Sciences & Research, Hyderabad, Andhra Pradesh, INDIA. 2Assistant Professor, Department of Community Medicine, S.V. Medical College, Tirupati, Andhra Pradesh, INDIA. 3Assistant Professor, Department of Community Medicine, Mamata Medical College, Khammam, Andhra Pradesh, INDIA. 4Professor, Department of Community Medicine, Mamata Medical College, Khammam, Andhra Pradesh., INDIA. Background: Mortalities associated with tobacco are very high, making it a disease of public health importance. 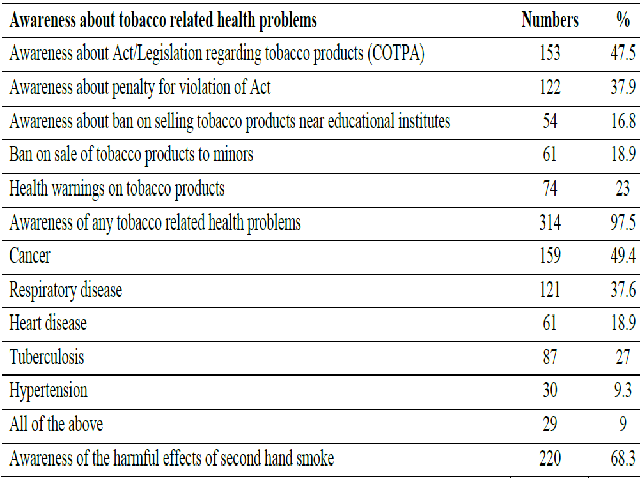 The “Cigarettes and Other Tobacco Products (Prohibition of Advertisement and Regulation of Trade and Commerce, Production, Supply, and Distribution) Act (COTPA)” has been formulated to control this epidemic. Information on knowledge, attitudes and practices of population regarding COTPA is necessary to effectively implement the legislation. Hence the present study was undertaken. Material and methods: The present study was a cross-sectional community based survey carried out in Khammam town. Data was collected using a structured schedule by interviewing 322 participants (mean age 37.5 years). Proportions, percentages and Odd’s ratio were calculated for relevant variables. Results: Overall awareness about COTPA was 47.5%. Higher education, higher SES, and increasing age had positive influence on awareness. Awareness regarding any tobacco related health problem was very high at 97.5%, among which it was highest (49.4%) for cancer followed by respiratory disease (37.6%). About two thirds (68.9%) of the participants had a favourable attitude towards COTPA. The positive attitude was more (73.3%) towards display of health warnings on tobacco products. Older participants (OR 7.6), people from higher SES, and more years of education were more likely to have positive attitude towards COTPA (OR 4.5). Current use of any tobacco was reported by 56.2% of the participants. Conclusion: a concerted effort has to be made to increase the awareness of the Act amongst the vulnerable population.